As the concerns over the Zika virus continue to grow, many people are searching for an effective way to protect our families from this growing threat. While there are many commercial products on the market today that can help you ward off bugs and prevent bug bites, they often contain some questionable active components, including DEET, which is a controversial ingredient that has been shown in some recent studies to carry a risk for long-term health effects. Fortunately, you can make a natural insect repellent that will keep bugs away naturally. These natural insect repellent sprays are DEET-free and use natural ingredients that won’t harm your family and that are safe for the environment. While the Centers for Disease Control and Prevention (CDC) and FDA approves the use of DEET as an effective mosquito repellent, it should never be used on an infant and is recommended only be used in reduced doses for children. A homemade insect repellent using natural oils and essential oils is an excellent alternative for keeping insects away. If you’re tired of spending your summers indoors to avoid being covered in mosquito bites, and you are uncertain about using a bug repellent containing DEET on your family, there’s some good news. Diluting different essential oils in a friendly carrier oil, like olive oil, coconut oil, or grapeseed oil, can effectively keep insects at bay. The essential oils that you can use will vary depending on the bugs you’re trying to repel. If you try one of these natural alternatives for bug protection and you don’t feel it’s working, go ahead and give one of the other DIY insect spray recipes a try. As with any essential oil, you have to use caution when putting it directly on your skin. Before placing any essential oil on your skin, you need to test it on a small area to check for skin irritation and allergic reaction. Also, it is important to note that you should only use ingredients that have been approved by the environmental protection agency (EPA) for pesticidal purposes. If you’re looking for ways to repel mosquitoes naturally, then this simple, non-toxic mosquito repellent is perfect for you. This bug spray recipe uses some of the best essential oils for repelling mosquitos and is incredibly easy to make. With this natural repellent, you can get back to enjoying the outdoors this summer. In a two-ounce amber spray bottle, add all of the ingredients. Replace the lid and shake the bottle vigorously to ensure the elements are mixed. Be sure to shake the bottle before each use and reapply often. You can also double the recipe and store it in a larger spray bottle. Citronella is a favorite mosquito-repelling ingredient for a reason. Mosquitos hate the smell of citronella and will do anything to avoid it. If you want to get rid of mosquitos and continue to enjoy your outdoor space, you can place citronella candles around the area, or you can grow citronella plants. If you want to repel mosquitos when you’re away from your house, you can rub citronella oil on your exposed skin. When you go camping, mosquitos can present an extra challenge because there are just so many of them. Unlike ants, wasps, and other insects, mosquitoes aren’t trying to get to your food, but instead, they are after you. The following simple homemade mosquito repellent recipe uses either lemon eucalyptus oil or lavender oil to repel mosquitos. Mix either the lavender oil or the oil of lemon eucalyptus with the water. Pour the mixture into the spray bottle. Replace the top and shake to combine the ingredients. Apply the repellent to your skin as you would with any other bug repellent spray. If you’re heading outside this summer for sporting events, picnics, yard work, or to relax on your back patio, chances are you’ve already seen a bug or two flying around. While covering up before you head outside is the best option for decreasing the number of bug bites you get, it isn’t always realistic. Whipping up a batch of this homemade mosquito repellent will help keep you from being eaten alive this summer. In a spray bottle that is 3 or 4-ounces, add the carrier liquids. Next, add the essential oils to the spray bottle. Put the cap back on and shake the ingredients well to combine. Reapply the natural bug repellent every few hours for the best results. There is nothing quite like spending some quiet time outdoors to calm your mind and refuel your spirit. Unfortunately, the threat of mosquitos and other insects can quickly dampen your enthusiasm. If you want to spend time outside, then you’ll have to use some insect repellent, but most of the commercial sprays contain questionable ingredients. Fortunately, you don’t have to use any of these or skip the repellent to enjoy time outside. This homemade mosquito repellent balm will keep bugs away. Place the beeswax, cocoa butter, coconut oil, and castor oil in a heat-safe bowl. Place the pan over a saucepan of hot water to gently melt the ingredients, stirring constantly. When the beeswax completely melts, remove the pot from the heat and allow to cool slightly. Add the essential oils and mix thoroughly. Pour the mixture into metal tins, glass jars, or cosmetic grade plastic containers to solidify. This product should only be used on those who are four years or older, and shouldn’t be used if you are pregnant. For a milder product to use on children between the ages of two to four and for pregnant women, you can eliminate the lemongrass, citronella, and peppermint oil from the mix. Like mosquitoes, yellow jackets can quickly ruin your outdoor party. While many commercial products can help you deal with yellow jackets in your yard, these often contain harsh chemicals that could be dangerous to children and pets. Here’s a homemade yellow jacket killer trap that is easy to make and can effectively deal with yellow jackets in your yard. Take the lid off the old soda bottle and discard it in the trash. Approximately ¼ of the way down from the top of the bottle, make a complete cut across the container. Pour the apple cider vinegar into the base of the bottle. Add a couple of drops of liquid dish soap and stir well to combine. Take the top of the container and place it upside down inside the base, making sure there is some space between the liquid and the opening of the bottle. The two pieces should fit together snugly, but you can place duct tape around the outside if needed. The sweet scent of the apple cider vinegar will attract the wasps. When the wasps enter the container, their legs and wings will become covered with dish soap, leaving them unable to fly back out of the bottle. Before you dispose of the bottle, make sure that all the wasps are dead. If you want to make homemade bug spray, but are overwhelmed with some of the recipes that contain a ton of ingredients, many of which you don’t have on hand. Not only does this bug repellent work great, but it is inexpensive and easy to make. Place the coconut oil or other carrier oil in a glass jar. Next, slowly add the essential oils to the bottle. Finally, stir or shake your oil well to mix the ingredients and store out of direct sunlight, in a cool and dry place. To use, place a small amount of the oil in the palm of your hands, rub it together, and massage into your skin before you head outside. Tea tree oil, also known as Melaleuca, a native tree in Southern Australia, is the basis for this effective DIY insect spray. An excellent essential oil, tea tree oil has antimicrobial, anti-inflammatory, and antibiotic properties, and it is incredibly toxic to insects. Add in a bit of geranium essential oil, and you have yourself an effective spray that will repel all kinds of insects. Pour the vegetable glycerin in the spray bottle. Add the essential oils, then fill the rest of the container with the distilled water. Replace the lid to the bottle and shake to combine the ingredients. Apply to exposed skin as needed. Lemon balm is one of many plants that keep flies away thanks to its strong smell. It is a lot like Citronella, but you won’t lose the butterflies or birds from your yard. Lemon balm is a plant that grows effectively and requires less maintenance, so it is incredibly easy to handle. Marigolds are a natural insect repellent that you can plant in your yard in the spring and summer. The scent that Marigold gives off is toxic to mosquitoes and other insects. You can plant these beauties around your porch or patio to repel unwanted mosquitoes and bugs away. They are incredibly easy to care for and will fill your yard with color, all while repelling mosquitoes and other insects. As with just about any household item, you can make a natural bug spray at home that is easy and inexpensive. This recipe for a natural insect repellent takes only seconds to make and will effectively repel bugs. With the help of a variety of essential oils, this 5-minute bug spray is incredibly useful for protecting you and your family from insects naturally. Put the essential oils in a glass spray bottle, then add the alcohol or vodka and shake well to combine. Next, add the witch hazel, again shaking the bottle to mix. Add the vegetable glycerin and water and stir again. Before each use, make sure to shake the bottle again because the water and oils will separate over time. If you live in an area where ticks are prevalent during the summer months, then you’ll need this recipe for tick and insect repellent. Be warned, however, that when wet this repellent stinks, but the scent will disappear as the repellent dries. It is inexpensive to make and works well at keeping insects and ticks away. Place the dried herbs and vinegar into the glass jar. Seal it tightly and place it on the counter. Make sure you shake the jar well every day for two to three weeks. After two to three weeks, use a colander to strain the herbs from the liquid. Pour the liquid into spray bottles and store in the refrigerator. To apply, dilute with water and spray on skin. The vanilla extract that you probably already have in your pantry can make an excellent homemade insect repellent. Pesky insects like mosquitoes, deer flies, ticks, gnats, and black flies can’t stand the smell of vanilla, making them stay clear of you. All you need to do is add a tablespoon of pure, sugarless vanilla extract into a small, shallow container. Then add one tablespoon of water to the container and mix thoroughly. Dip a cotton ball into the mixture and wipe it over your skin. Then apply some undiluted drops of vanilla extract to other pulse points. Reapply the solution every 30-45 minutes. Lavender is a handy plant to have around your house. Not only can planting lavender in your yard protect your other plants from unwanted insects, but it can keep bugs from biting you. You can also use the flowers of the lavender plant or lavender oil on your skin, to repel insects. Rubbing the lavender on your pulse points, like on the inside of your wrists or behind your ears will allow the essential oil to be dissipated by the heat from your body. Garlic is another natural bug repellent that you can try to get rid of unwanted insects. Mosquitoes and other insects don’t like the smell emitted by garlic, which means they will keep far away from anything that smells of garlic. Depending on how much you like garlic, you can try taking a garlic supplement or eat a lot of food that contains garlic. You can even try to rub a clove of garlic on your exposed skin. One thing is sure; if you walk around smelling like garlic, you’ll be able to ward off mosquitoes and other insects. One of the best ways to repel insects is to cover up your skin. If you’re going outside to a place that is known to have a ton of bugs, make sure you wear long pants, closed-toed shoes, and a long sleeve shirt, and use a natural insect repellent on your hands and face. If your skin is covered, the biting bugs and insects, like mosquitoes, won’t be able to get to your skin. Much like the other essential oils that you can use to deter pests, neem oil contains compounds that many insects hate, making it an effective bug repellent. Neem oil comes from the evergreen neem tree. You can add two tablespoons of neem oil to a spray bottle with some witch hazel for an effective natural insect repellent spray. Add a small amount of vegetable glycerin to help the ingredients combine better. This DIY bug repellent lotion bar is incredibly easy to make and is an effective way to keep bugs away. They are easy to bring with you on the road, and even kids can apply this repellent themselves. Instead of being filled with toxic chemicals like commercial insect repellents, this recipe nourishes and moisturizes your skin all while keeping bugs away. Use a double boiler to heat one inch of water until it begins to boil. Place the dried rosemary, cloves, cinnamon, thyme, catnip, and mint in the top of the double boiler. Add the coconut oil. Cover the top part of the double boiler and keep the liquid simmering for at least 30 minutes. Use a cheesecloth or small mesh strainer to strain the herbs, removing them from the oil. Then pour the oil back into the double boiler. You should have about ½ a cup of the infused oil. Next, add the shea butter and beeswax to the double boiler and stir the mixture until the ingredients have mixed. Remove the pan from the heat. Add the Vitamin E oil and the rest of the essential oils. Pour the liquid into the silicone molds. Let the molds sit overnight until the liquid sets. You can speed up the process by placing them in the refrigerator. To use, rub the bars on exposed skin to protect against mosquitoes and other insects. This homemade bug repellent body lotion makes a long-lasting moisturizer that helps repel mosquitoes as well as black flies while soothing dry skin. The essential oils in the lotion are an all-natural way to protect your skin from pesky bugs. In the top of a double boiler, stir together the oil, emulsifying wax, and stearic acid until completely melted. Remove the pan from the heat and add the Vitamin E oil. In a separate pot, gently warm the water until lukewarm. Slowly pour the water into the oil, constantly stirring with a wire whisk until the mixture thickens. Let it cool slightly. Stir the essential oils and the grapefruit seed extract into the liquid. Pour the mixture into a clean, sterilized 8-ounce glass bottle and allow to cool before replacing the lid. Occasionally shake the container as the lotion cools to prevent the ingredients from separating. Store the bottle in a cool, dark place and use when needed. Making a homemade mosquito repellent cream will kill two birds with one stone. It will help to repel bugs while also moisturizing your skin. With simple, inexpensive ingredients, you can quickly whip up a batch of this incredibly useful repellent cream and be ready for your weekend plans outside. Melt the beeswax, Vitamin E oil, and coconut oil over low heat. In a second pan, heat the distilled water to boiling, then remove from the heat and add the baking soda. Slowly pour the water into the oil while mixing with a hand blender. The oil should turn white immediately to show that you’ve successfully achieved emulsification. Place the pan directly in an ice water bath in the sink. Add the essential oils. Mix until the ingredients are evenly and completely cooled. Place the cream in a jar of your choice. Apply to skin every day to moisturize and repel bugs. Nobody likes to deal with bugs during the long summer months. Rather than hiding out inside for the duration of the hot summer months, try one of these effective natural insect repellents. The recipes are easy to make and use inexpensive ingredients that you probably already have in your home. With these homemade insect repellent recipes and tips, you can start enjoying the outdoors once again this summer. 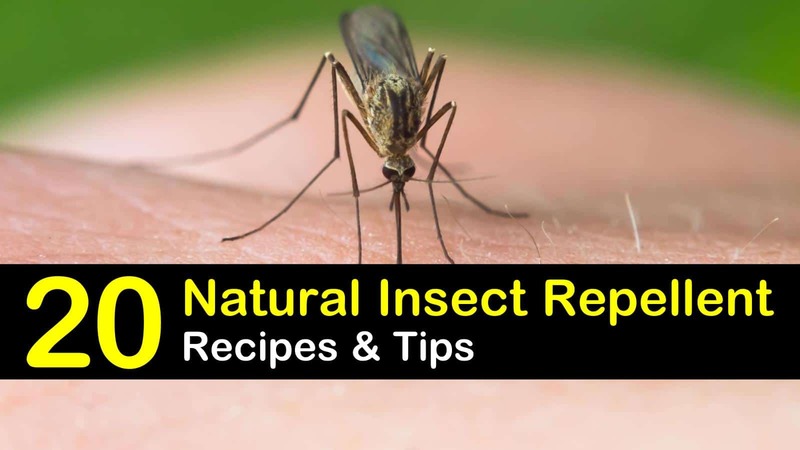 We hope you enjoyed learning about the various natural insect repellent tips and recipes that you can use to repel insects. 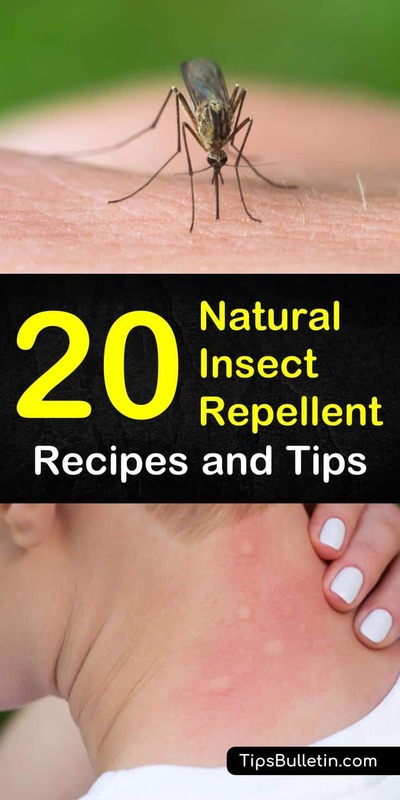 If you found these insect repellent recipes useful, please don’t hesitate to share these pest control tips with your family and friends.